Dabeli Masala also called Kutchi Masala. Dabeli Masala is the main ingredient of the making Dabeli, so today I’m sharing with you the original Dabeli Masala. If you are from Mumbai or from Gujarat, you know the perfect texture and taste of Dabeli Masala and here in the US that was missing. So searched lots of blog for Kutchi Masala but sadly original authentic recipe is missing. All recipes are like garam masala, I’m not blaming about those recipes, those will works too but the real taste nahhh…not possible, but thank god I got the real traditional recipe of Kutchi Dabeli Masala from my mother in law’s friend who is in dabeli masala making business. She and her family belong to Mandvi (Kutch) Gujarat and this is their 3rd generation in masala business and exporting all over India and some international countries too. Actually Me and My family is biggest fan of Indian street food specially Mumbai street food and dabeli one of them. Mumbai is one of the city in India where you can get anything everything homemade readymade. Even for dabeli you can eat out on street or make it at home but taste is almost same because of the quality of masala selling out in local shops…no I’m not talking about Everest, MDH or Badshah masala powder packets but the original masala which are mostly sold in a coarse powder form. Now days, it is readily available in most of the cities all over India, sold under various brand names like Chandubahi Bhanushali, Betubhai or Ghabha online brand…mainly manufactured and packed in Kutch. The dabeli masala made from Mandvi and Bhuj are preferred by people for their taste and ethnicity. 1. First roast coriander seeds, cumin seeds, fennel seeds, clove, peppercorn, cinnamon, anise and bay leaves in the pan for a minute on medium flame, transfer it to the plate and let it cool down. 2. Now roast grated coconut, dry red chili and sesame seeds in the same pan for less than a minute on low flame, transfer it to the same plate and mix with the pre-roasted mixture. Keep aside for few minutes. 3. Add all the roasted ingredients into the grinder bowl. Add black salt, red chili powder and salt, mix it and grind it till powder form (no need to make fine powder). 4. Now remove it into the mixing bowl. Add sugar, oil and mix it using your fingers. 5. Dabeli Masala is ready. You can store it into the airtight container and keep it into the refrigerator, you can use it whenever you need it. • It can be store up to 10-12 month into the refrigerator but in the airtight container. • You can add ½ tsp garlic powder if you like the garlic taste. First roast coriander seeds, cumin seeds, fennel seeds, clove, peppercorn, cinnamon, anise and bay leaves in the pan for a minute on medium flame, transfer it to the plate and let it cool down. 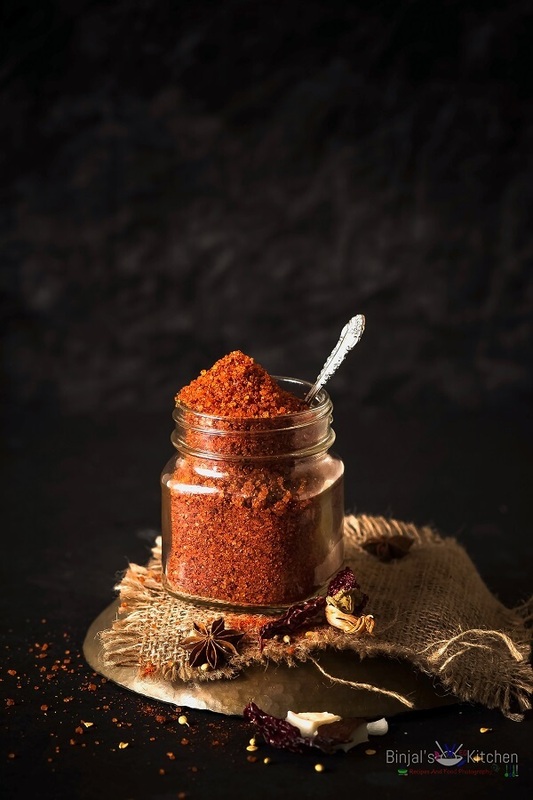 Now roast grated coconut, dry red chili and sesame seeds in the same pan for less than a minute on low flame, transfer it to the same plate and mix with the pre-roasted mixture. Keep aside for few minutes. Add all the roasted ingredients into the grinder bowl. Add black salt, red chili powder and salt, mix it and grind it till powder form (no need to make fine powder). Now remove it into the mixing bowl. Add sugar, oil and mix it using your fingers. Dabeli Masala is ready. You can store it into the airtight container and keep it into the refrigerator, you can use it whenever you need it. The masala sounds perfect! Binjal which spice grinder do you use to grind spices here in US?